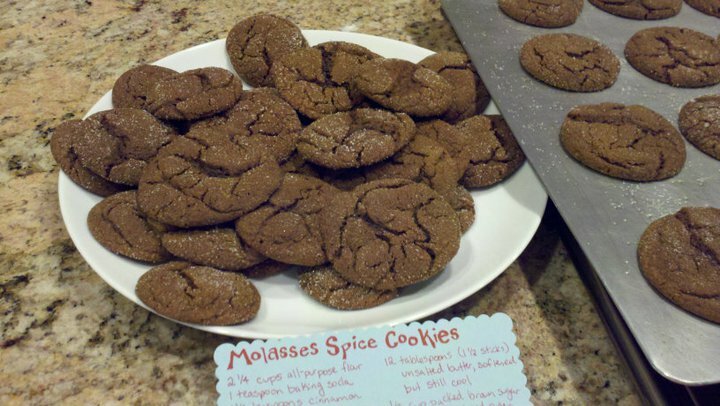 I started the search for the perfect molasses cookies my senior year in high school, when I took Ms. Stegall’s writing sem. Every now and then, she would bring in these cookies–I can remember the fragrance of mingled clove and cinnamon spilling out into the hallway, the texture of the sugar granules surrounding the buttery molasses goodness. I don’t know why I never thought to ask for the recipe. 1 Preheat oven to 375°F. Mix together flour, baking soda, salt, cinnamon, ginger, cloves, allspice together in a bowl and set aside. 3 Add dry ingredients and beat at low speed until just combined, about 30 seconds. 5 Bake until the outer edges of the cookies begin to set and centers are soft and puffy, about 11-12 minutes, do NOT overcook. *** Cool cookies on sheets for 2 to 3 minutes before transferring them to cooling racks . *** The centers of the cookies should be somewhat soft and spongy (they look under-cooked) when you take them out of the oven, otherwise they will end up hard and dry. There’s an optional glaze, but I’ve never tried it…I really think these cookies are the cat’s pajamas without the added hoopla (though Eric and I once made them with homemade cream cheese frosting, but that was pretty much just an excuse to eat frosting with a spoon). Now I just need to try a gluten-free alternative…rice flower? Otherwise I’ll be forced to stick with frosting and fro-yo, I suppose. And chocolate. this holiday cheer was a big hit in Los Angeles. Everyone is looking forward to meeting you. Mmmm…. I just made these last week for my Bible Study because I missed you. I told them that I made the cookies because I missed Autumn, but clearly it was you that I miss! Yum yum yum! oh honey! you’re so sweet! how’d they turn out? miss you back! Delicious! I had to bring them to work to keep myself from eating the whole batch. Clearly self-control is not my strong suit around these heavenly cookies! P.S. One of my goals for the Fall is to master parisian macarons. And since they’re made with almond flour, I think it will be mandatory that you come visit and help me eat them. YES!!!! LOVE it! Done and done. tricia!!! so good to hear from you! how have you been?? i love you! and i always think of you whenever i make that soup 🙂 miss you and think of you frequently…much love!